Continuation from the previous 74 parts, the whole series can be found at http://www.nikoport.com/columnstore/. This blog post focuses on one of the newest additions to SQL Server 2016, the feature that most probably has gained a universal appraisal since the announcement – the Stretch DB and its integration with Columnstore Indexes. 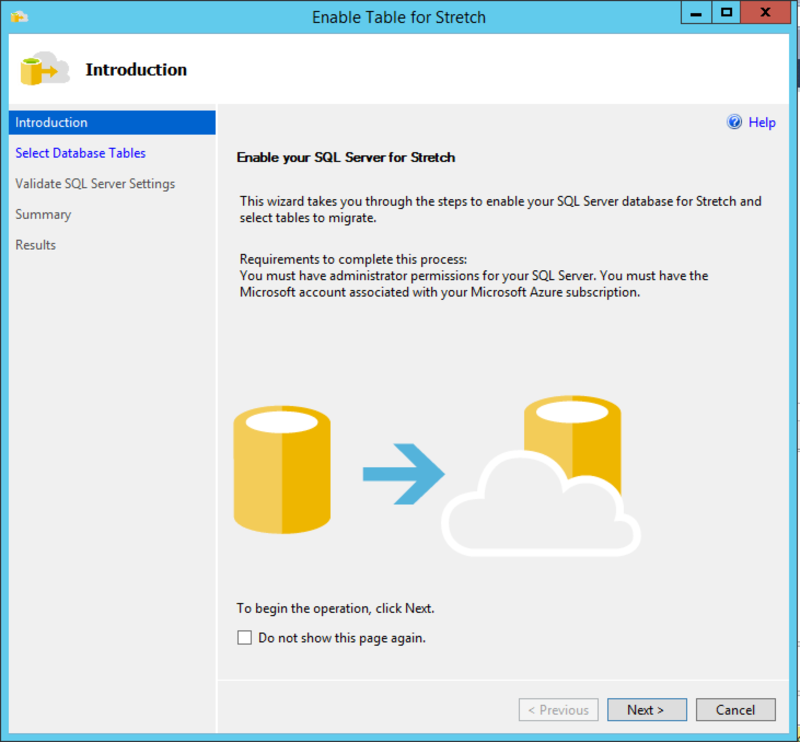 Stretch DB or alternatively Stretch Database is a way of spreading your table between SQL Server (on-premises, VM in Azure) and a Azure SQLDatabase. 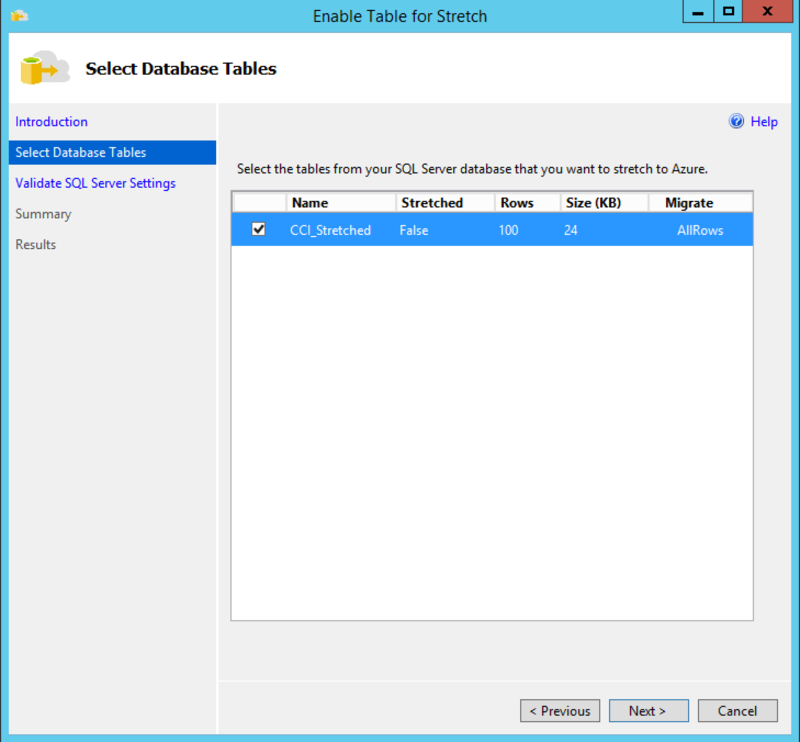 This means that the dat of the table will shared between the SQL Server and the Azure SQLDatabase giving the opportunity to lower the total cost of the local storage, since Azure SQLDatabase is cheap relatively expensive storage typically used on the local SQL Server installations. This mean that the table data will be separated into Hot Data & Cold Data, where Hot Data is the type of data that is frequently accessed and it extremely important (this is typically some OLTP data) and the Cold Data (this is typically rarely or almost never accessed archival or log data). For the final user the experience should be the same as before – should he ask for some data that is not on the SQL Server, then it will be read from Azure SQLDatabase by the invocation of remote query, joined with the local results (if any) and then presented to the user. Currently with SQL Server 2016 CTP 3.2 with GUI Wizard we can only migrate whole table to Azure SQLDatabase but with the help of T-SQL we can already control the predicate filter. Since the StretchDB is focusing on helping to manage big amounts of data, one of the key elements in order to lower the cost is the usage of Columnstore Indexes and here I will focus on testing StretchDB compatibility with them. 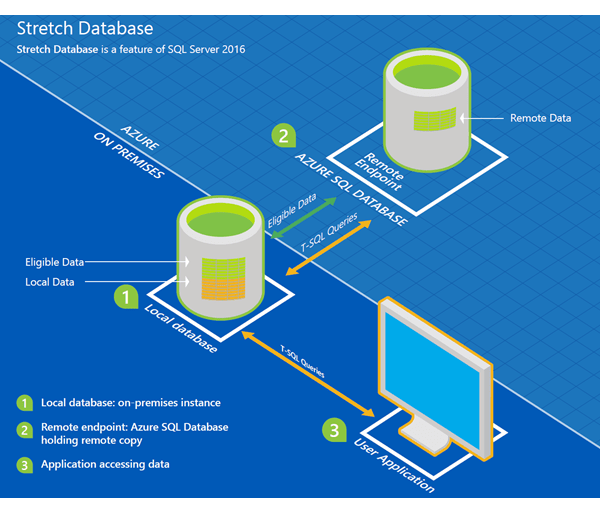 We will need to create a Azure SQLServer & SQLDatabase that will have those credentials created in the previous step, or we might simply reuse the existing one. In my case I simply went to Azure Portal and created a new server with database for this test. Notice that you will need to give enough permissions on Azure SQLDatabase for your user to be able to create a new database. Let's stretch a table, and this time for the experiment I will pick dbo.FactITMachine table. where you can see that we have received a pretty concrete message that the type of index used in the table (Clustered Columnstore is the only index there) is not supported for Stretch Databases. If clicking on the error details you will be presented with a more definitive error message confirming that Clustered Columnstore Indexes are not supported. The script was executed without any error message - did it work ? Let's open the Stretch Database Monitor - but the table is not listed there ! 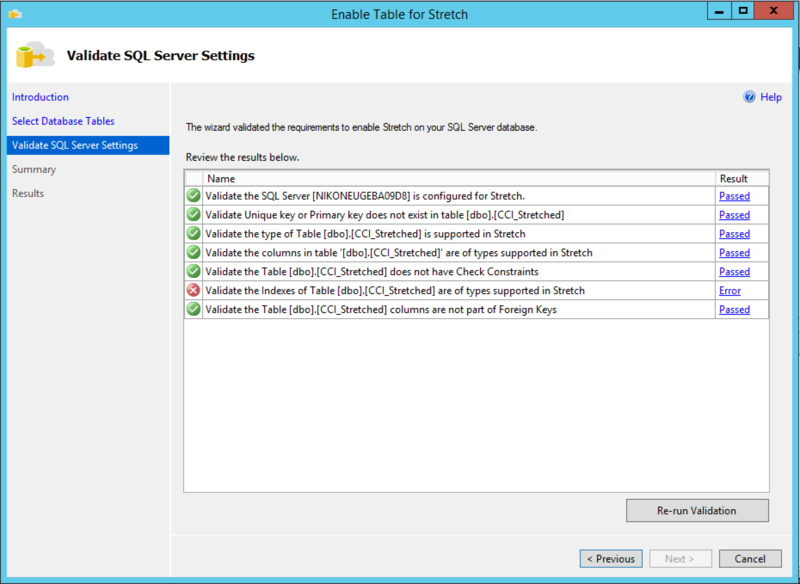 The result is the dbo.CCI_Stretched table and so the extended event is correct - we can't have our table stretched to Azure SQLDatabase. Given that the database created for the StretchDB is a Standard S3 one, I went to Azure Portal and manually upgraded it to P1 (Premium). Let us hope then that there will be a possibility for choosing an edition while stretching databases. This will allow to avoid all possible problems. There is one more scenario that one should consider when thinking about Columnstore Indexes: the newest addition for the In-Memory Tables: InMemory Operational Analytics. 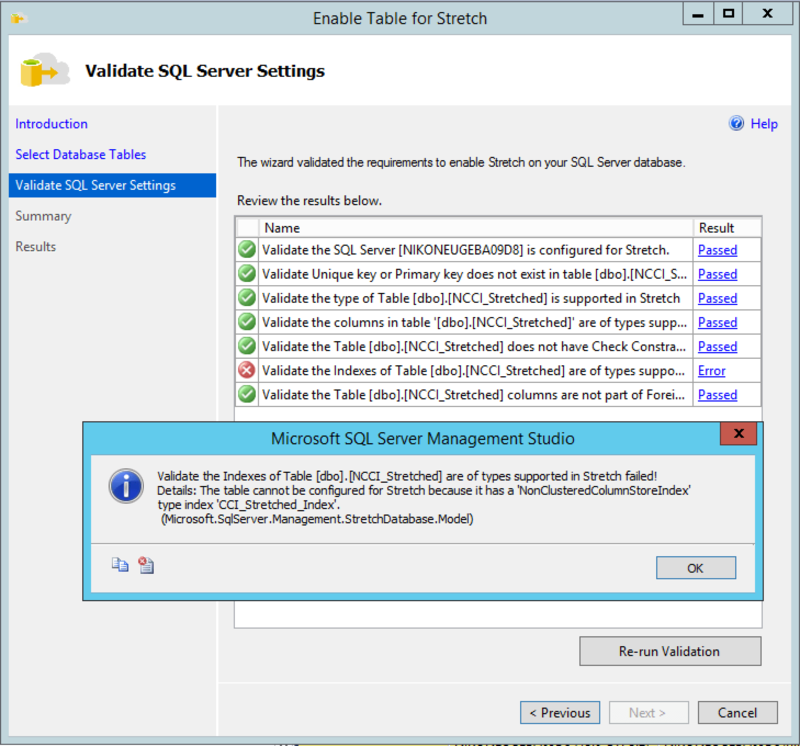 Heading to the Surface area limitations and blocking issues for Stretch Database will help you to discover the limitats and the Memory-optimized tables overall are not supported for the current version. Thinking about the impossibility of Columnstore Index stretching i realised that the default Azure SQLDatabase that is created for StretchDB is the Standard one (S3), where Columnstore Indexes are not supported at the moment. Otherwise the technology should work without any problems. 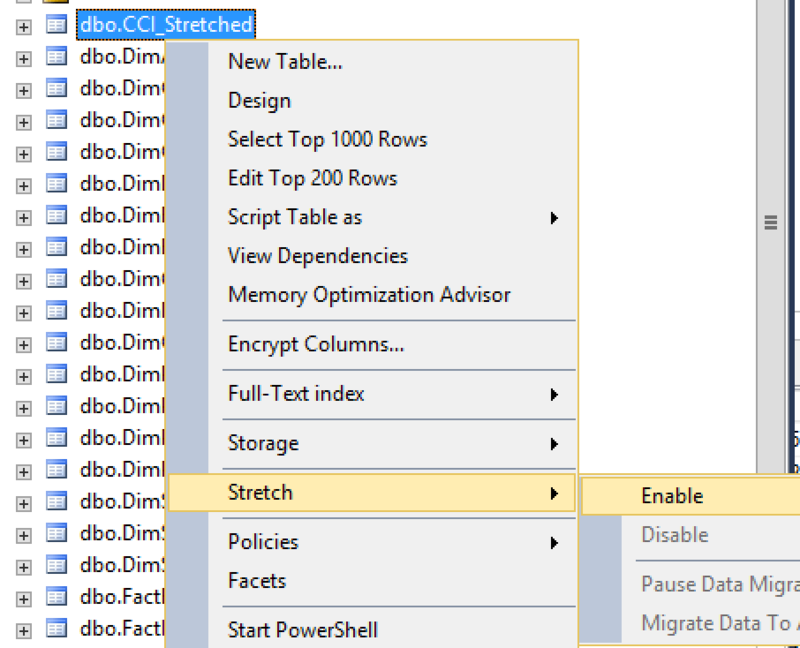 The last T-SQL query sample seems to need to changing from “dbo.CCI_Stretched” to “dbo.NCCI_Stretched”. and Thank you, nice blogs. thank you very much for the correction and for the kind words – I have updated the blog post.